The UNC School of Media and Journalism has a new banner in its future after winning its third straight Hearst national championship — often called the Pulitzer of college journalism. And, for the first time ever, the Hearst Foundation awarded the champions a $25,000 monetary award. 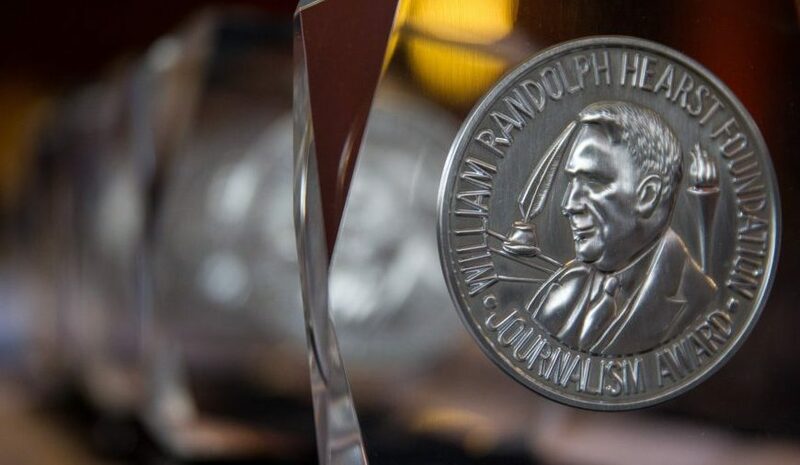 The win brings the MJ-school’s total to seven national championships — five since 2010 — for the Hearst Journalism Awards Program, more than any other university. Individual students also won national championships. Claire Collins ’17 won the multimedia competition. Jessica O’Connor ’17, won the radio competition and the top radio story of the year award. Mac Snyder ’16 placed third in the photo competition, Casey Toth ’17 placed fifth in multimedia, and John Thomas ’17 placed fifth in radio. The Hearst program holds yearlong competitions in broadcast news, multimedia, photojournalism and writing. The categories include five monthly writing competitions, two photojournalism competitions, three broadcast news competitions (one in radio and two in television) and four multimedia competitions. The program awards scholarships to students for outstanding performance in college-level journalism, with matching grants to the students’ schools. The overall intercollegiate winners are those schools with the highest combined student points. In addition to first place overall, UNC’s MJ-school has finished second in the broadcast news, multimedia and photojournalism competition categories.